The QF 3-pounder Hotchkiss or in French use Canon Hotchkiss à tir rapide de 47 mm were a family of long-lived light 47 mm naval guns introduced in 1886 to defend against new, small and fast vessels such as torpedo boats and later submarines. There were many variants produced, often under license which ranged in length from 32 to 50 calibers but 40 caliber was the most common version. They were widely used by the navies of a number of nations and often used by both sides in a conflict. They were also used ashore as coastal defense guns and later as an anti-aircraft gun, whether on improvised or specialized HA/LA mounts. The French Navy used two versions of the Hotchkiss 3-pounder: the short-barreled 40-caliber M1885 and the long-barreled 50-caliber M1902. The French L/40 M1885 and the British QF 3-pounder were largely the same gun. Like the British who paired their 3-pounders with the larger QF 6-pounder Hotchkiss the French often paired theirs with the Canon de 65 mm Modèle 1891 sometimes called a 9-pounder in English publications. The 3-pounder was primarily used as anti-torpedo boat defense aboard armored cruisers, destroyers, ironclads, pre-dreadnought battleships, protected cruisers and submarines. During World War I, the role of the guns changed from anti-torpedo boat defense to anti-aircraft defense and new high angle mounts were developed but were found to be ineffective. After World War I the majority of 3-pounders in the anti-aircraft role were replaced with either the anti-aircraft version of the Canon de 75 modèle 1897 or the Canon de 75 mm modèle 1924. A 3-pounder Hotchkiss was used on an improvised mounting in a battle that resulted in Australia's first prisoners of World War 2 being captured near Berbera in 1940. The guns are now used in a Three Pound Saluting Gun Battery at the Garden Island Naval Base. The Austro-Hungarian Navy used two versions of the Hotchkiss 3-pounder. The first was the short 47 mm SFK L/33 H of 1890 produced under license by Skoda. The second was the long 47 mm SFK L/44 S of 1897 produced under license by Skoda. These two guns were the primary rapid fire anti-torpedo boat guns of many ships built or refitted between 1890 and 1918. On 16 August 1914 at the Battle of Antivari, the Austro-Hungarian protected cruiser SMS Zenta was sunk by a combined Anglo-French force. Both sides in the battle were armed with Hotchkiss guns. China adopted the Hotchkiss 3-pounder in the 1880s, to arm its cruisers and smaller auxiliaries; the Hai Yung-class cruisers of the Imperial Chinese Navy built by AG Vulcan Stettin were armed with Nordenfelt 3-pounder guns firing the same ammunition. During the First Sino-Japanese war, ships of both sides were armed with Hotchkiss 3-pounder guns. Italy adopted the Hotchkiss 3-pounder in the 1880s to arm its armored cruisers, battleships, protected cruisers, torpedo boats and torpedo cruisers. Ships on both sides of the Italo-Turkish war were armed with 3-pounder guns. The Italians carried Hotchkiss and Vickers guns, while the Ottoman Navy carried Nordenfelt guns. Japan adopted the Hotchkiss 3-pounder 5-barrel revolver cannon in the 1880s and later adopted the simpler single-barrel quick-firing weapon. The Japanese versions of the 3-pounder were known as Yamanouchi guns and were largely identical to their British equivalents. The Japanese also had a related 30 caliber 2½-pounder gun from Elswick, the Yamanouchi Mk I. During the Russo-Japanese War, ships of both sides were armed with Hotchkiss 3-pounder guns. The Japanese found them to be ineffective and removed them after the war. Polish 47 mm Hotchkiss guns named the wz.1885 gun, were used on first ships of the Polish Navy, received after World War I, like ex-German torpedo boats and minesweepers. By the time of World War II most had been replaced on naval ships but several stored guns were used in combat on improvised stationary mounts by Land Coastal Defence units in the Battle of Kępa Oksywska in September 1939. The Romanian Navy used the Škoda-produced version of the gun. The gun was used as secondary and later tertiary armament on the Romanian monitors of the Mihail Kogălniceanu class. It also served as the main armament of the Căpitan Nicolae Lascăr Bogdan class of armored multi-purpose boats, each of the 8 boats carrying one gun. Russia adopted the Hotchkiss 3-pounder 5-barrel revolver cannon in the 1880s, and later adopted the less complicated single-barrel 43 caliber quick-firing weapon. The 5-barrel guns were equipped on the Ekaterina II-class battleships commissioned in 1889 but by 1892 the battleship Dvenadsat Apostolov and her successors had single-barrel weapons. In 1888 licensed production of a Russian variant started at the Obukhov State Plant. During the Russo-Japanese War, ships of both sides were armed with Hotchkiss 3-pounders, which were found to be ineffective against Japanese torpedo boats and were removed from first-line warships after the war. The Evstafi class, commissioned in 1910 ceased carrying the weapon but they were later fitted to patrol vessels and river craft during World War I and at least 62 weapons were converted to anti-aircraft guns by 1917. In 1886 this gun was the first of the modern Quick-firing (QF) artillery to be adopted by the Royal Navy as the Ordnance QF 3 pounder Hotchkiss, built under licence by the Elswick Ordnance Company. By the middle of World War I the Hotchkiss gun was obsolescent and was gradually replaced by the more powerful Ordnance QF 3 pounder Vickers gun. Of the 2,950 produced it is estimated that 1,948 were still available in 1939 for RN use. The availability, simplicity and light weight of the gun kept it in use in small vessels and many were later brought back into service on merchant vessels used for auxiliary duties in World War II or as saluting guns and sub-calibre guns for gunnery practice until the 1950s. Early in WWII, it was also pressed into service in ports around the British Empire, to defend against possible incursions by motor torpedo boats, until the modern QF 6 pounder 10 cwt gun became available. The US Navy used several types of 3-pounder guns from multiple manufacturers and it is difficult to determine from references which type a particular ship carried. Hotchkiss 3-pounder 5-barrel revolving cannons were used, along with single-barrel quick-firing single-shot Hotchkiss 3-pounders. Both are called rapid-firing (RF) in references. Ships on both sides in the Spanish–American War were armed with Hotchkiss 3-pounders. By 1910 the US was building the dreadnought-type South Carolina class, with a secondary armament composed entirely of 3-inch (76 mm) guns. Although removed from first-line warships by World War I, some 3-pounders were fitted on patrol vessels, with a few weapons serving on those ships through World War II. The most common types of ammunition available for 3-pounder guns were low yield Steel shells and common lyddite shells. 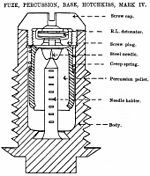 In World War II higher yield high explosive rounds were produced. Model of gun in French service on "elastic frame" mounting (affût-crinoline), at the Musée national de la Marine Paris. Russian Hotchkiss gun on a field carriage. Military-historical Museum of Artillery, Engineer and Signal Corps. St. Petersburg Russia. A 3-pounder coastal-defense gun at Sydney harbor 1942. A Russian 3-pounder on a Renault armored car 1917. The Imperial Russian cruiser Rossia. 3-pounders at the bottom left/right. The Jardines Noonday gun at Causeway Bay, Hong Kong. Four guns on the tall ship Libertad, which serves as a school ship in the Argentine Navy; all fully operational as saluting battery or multipurpose defense. 3 guns used for ceremonial purposes at HMS Drake. ^ a b c DiGiulian, Tony. 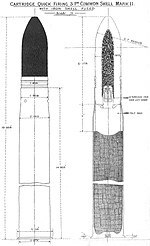 "USA 3-pdr (1.4 kg) [1.85" (47 mm)] Marks 1 through 12 – NavWeaps". www.navweaps.com. Retrieved 2017-07-05. ^ "38–37 MM CALIBRE CARTRIDGES". www.quarryhs.co.uk. Retrieved 2017-07-04. ^ a b c Friedman 2011, p. 118. ^ Friedman 2011, p. 229. ^ Navy, Royal Australian. "3-Pounder saluting guns". navy.gov.au. Retrieved 7 July 2017. ^ Media, Defence News and (7 July 2017). "Defence News and Media". defence.gov.au. Retrieved 7 July 2017. ^ a b c Friedman 2011, p. 295. ^ "Hai Yung protected cruisers (1898) – Chinese / People`s Liberation Army Navy (China / People`s Republic of China)". www.navypedia.org. Retrieved 2017-07-06. ^ Langensiepen & Güleryüz 1995. ^ Friedman 2011, p. 119. ^ Tym & Rzepniewski 1985. ^ a b DiGiulian, Tony. "Russia / USSR 47 mm (1.85") [3-pdr] – NavWeaps". www.navweaps.com. Retrieved 7 July 2017. ^ Friedman 2011, p. 265. ^ British forces traditionally denoted smaller ordnance by the weight of its standard projectile, in this case approximately 3 pounds (1.4 kg). ^ a b Campbell 1985, p. 66. ^ Friedman 2011, p. 197. ^ DiGiulian and Friedman differ on the details of Mk 10-12. ^ "AMMS Brisbane". www.ammsbrisbane.com. Retrieved 7 July 2017. ^ Weyant, Hervé. "Mémorial Maginot de Haute-Alsace". www.maginot68.com. Retrieved 7 July 2017. Tym, Wacław; Rzepniewski, Andrzej (1985). Kępa Oksywska 1939: relacja uczestników walk lądowych [Oksywska Fort 1939: Relations of Combatants on Land] (in Polish). Gdańsk: Wydawnictwo Morskie. ISBN 978-83-215-7210-9. The BL 9.2-inch Mk VIII naval gun was designed for the new cordite propellants and was the first British wire-wound gun of this calibre. The Fairmile B motor launch was a type of motor launch (often referred to as MLs) built by British boatbuilder Fairmile Marine during the Second World War for the Royal Navy for coastal operations. Hugh Charles Sweeny from Dalby, Queensland along with two other sailors were the first Australian POWs captured in World War II. They were captured during the initial outbreak of fighting in the East African Campaign. On 9 August 1940, three volunteers from HMAS Hobart went ashore in response to an urgent request for artillery support for the hard-pressed garrison. Petty Officer Hugh Jones from Kalgoorlie, Western Australia, Able Seaman William James Hurren from Sydney, New South Wales, and Able Seaman Hugh Charles Sweeny from Dalby, Queensland were landed with a QF 3 pounder Hotchkiss saluting gun on an improvised mounting, a reinforced 44-gallon drum. By early the next morning they were in position, manning the gun and dressed in military uniform on the main British defence line at Tug Argan Gap, some 60 kilometres south of Berbera. The fighting continued during the next five days but when the British evacuated between 15–19 August, the three Australian sailors were reported missing believed killed in action 15 August 1940. Instead, they had been captured by the Italians, the first members of an Australian unit taken prisoner of war (POW) during World War II. The three POWs from HMAS Hobart were recovered from Adi Ugri in Eritrea on 29 April 1941 after Italian East Africa fell to the British. Akitsushima (秋津洲) was a protected cruiser of the Imperial Japanese Navy (IJN), designed and built by the Yokosuka Naval Arsenal in Japan. The name Akitsushima comes from an archaic name for Japan, as used in the ancient chronicle Kojiki. Chihaya (千早) was an unprotected cruiser of the Imperial Japanese Navy. The name Chihaya comes from Chihaya Castle, near Osaka, the site of one of the battles of the Genkō War of 1333. Chiyoda (千代田) was a cruiser of the Imperial Japanese Navy, which served in the First Sino-Japanese War, Russo-Japanese War and World War I.
Hashidate (橋立) was the third (and final vessel) in the Matsushima class of protected cruisers in the Imperial Japanese Navy. The ship was the only one of the class constructed in Japan. Like sister ships, (Matsushima and Itsukushima) her name comes from one of the traditional Three Views of Japan, in this case, the Ama-no-hashidate in northern Kyoto prefecture on the Sea of Japan. Ikoma (生駒) was the second vessel in the two-ship Tsukuba class of armoured cruisers in the Imperial Japanese Navy. She was named after Mount Ikoma located on the border of Osaka and Nara prefecture. On 28 August 1912, Ikoma was re-classified as a battlecruiser. Miyako (宮古) was an unprotected cruiser of the early Imperial Japanese Navy. The name Miyako comes from the Miyako Islands, one of the three island groups making up current Okinawa prefecture. Miyako was used by the Imperial Japanese Navy primarily as an aviso (dispatch boat) for scouting, reconnaissance and delivery of high priority messages. Tatsuta (龍田) was an unprotected cruiser of the Imperial Japanese Navy. The name Tatsuta comes from the Tatsuta River, near Nara. Tatsuta was used by the Imperial Japanese Navy primarily as an aviso (dispatch boat) used for scouting, reconnaissance and delivery of priority messages. Yoshino (吉野) was a protected cruiser of the Imperial Japanese Navy. Yoshino is sometimes regarded as a sister ship to Takasago, although the two vessels are of different classes. The name Yoshino comes from the Yoshino mountains, located in the southern portion of Nara prefecture. She played an important role in the First Sino-Japanese War, but was sunk in the Russo-Japanese War after being rammed by Japanese armored cruiser Kasuga in dense fog. The Kasagi-class cruiser (笠置型巡洋艦, Kasagi-gata jun'yōkan) was a class of two protected cruisers of the Imperial Japanese Navy built in the United States at the end of the 19th century. The Ordnance QF 3-pounder Vickers (47 mm / L50) was a British artillery piece first tested in Britain in 1903. It was used on Royal Navy warships. It was more powerful than and unrelated to the older QF 3-pounder Hotchkiss, with a propellant charge approximately twice as large, but it initially fired the same Lyddite and steel shells as the Hotchkiss. A quick-firing gun (in U.S. parlance, 'rapid-firing') is an artillery piece, typically a gun or howitzer, which has several characteristics which taken together mean the weapon can fire at a fast rate. Quick-firing was introduced worldwide in the 1880s and 1890s and had a marked impact on war both on land and at sea. The two Suma-class cruisers (須磨型防護巡洋艦, Suma-gata bōgojun'yōkan) were protected cruisers operated by the Imperial Japanese Navy. While more lightly armed and armored than many of its contemporaries, their small size and relatively simple design facilitated their construction and their relatively high speed made them useful for many military operations. Both participated in combat during the Russo-Japanese War and World War I.